Pietro Caranci first appears in the Painesville, Ohio, area from 1922 to 1928. In America, Pietro Caranci was known as Peter Caranci. Pietro Caranci, son of Antonio Caranci, was born on July 7, 1893, at Castelpizzuto, Italy. He married Maria Rosa DiSanto on October 5, 1919 at Italy. 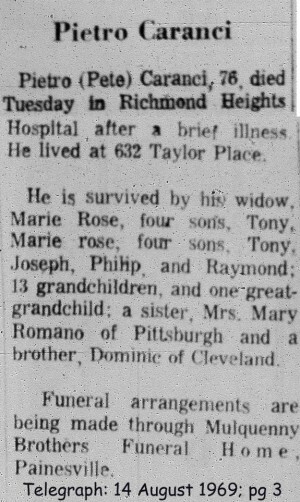 Pietro died on August 12, 1969, at Richmond Heights Hospital, Richmond Heights, Cuyahoga County, Ohio, at age 76. His body was interred at Riverside Cemetery at Painesville, Lake County, Ohio. Pietro Caranci immigrated to the United States at New York City, New York, on June 12, 1920, at age 26. Pietro and his wife, Maria DiSanto, were traveling to Cleveland, Ohio, to join Pietro’s brother, Domenico Caranci. Pietro and his wife lost their first child (not named) on April 6, 1921. They lived at 7808 Connectucut Avenue, Cleveland, Cuyahoga County, Ohio, on April 6, 1921. Pietro Caranci became a citizen of the United States on October 1, 1928. Pietro resided at 368 Sanford Street, Painesville, Lake County, Ohio, when he was naturalized. Pietro Caranci owned and operated Roma Restuarant on Sanford Street from 1927 to 1962.